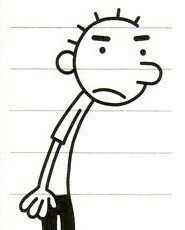 Diary of a Wimpy Kid #6! Most people look forward to the holidays, but the stretch between Thanksgiving and Christmas just make me a nervous wreck. If you make a mistake in the first eleven months of the year, it’s no big deal. But if you do something wrong during the holiay season you’re gonna pay for it. So funny!!! You definitely have to read it before the next snowfall!